Delightful Little Mess: A flying saucer! In an attempt to not have the bathroom faucet constantly running for the thirsty little cats, I dug out the water fountain I bought years ago for my kidney cat. It was my way of trying to get her to drink more water, although she being a little princess wanted nothing to do with the fountain. 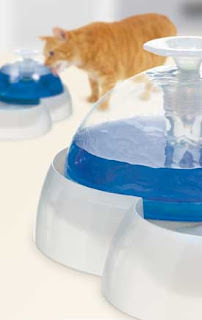 The fountain is a the Catit® Design Fresh & Clear Drinking Fountain that looks like a space ship. It pumps the water up through the center and it flows over the dome back into the bowl. Cats can drink from the bowl or the dome itself.